Epilepsy and movement disorders surgery. Craniofacial surgery. Treatment of spasticity. Paediatric neuroendoscopy. I received my Degree in Medicine from the University of Barcelona in 2003 before specialising in Neurosurgery at Hospital Clínic (2004 – 2009). I am currently a specialist surgeon in Paediatric Neurosurgery at SJD Barcelona Children’s Hospital, where I have worked since 2009 and where I have been a senior specialist since 2015. 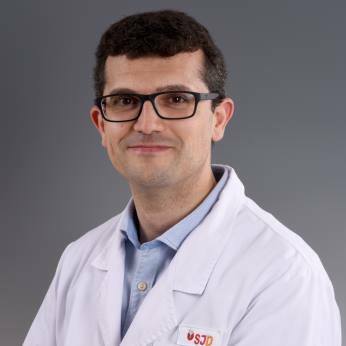 I am an active member of the Spanish Neurosurgery Society (SENEC), the Spanish Paediatric Neurology Society (SENEP) and the SENEC Paediatric Neurosurgery Working Group. Degree in Medicine and Surgery from the University of Barcelona, 2003. Complete doctorate courses at the University of Barcelona, 2004 – 2006. Certificate of research competence, 2007. Specialisation in Neurosurgery at Hospital Clínic, 2004 – 2009. Paediatric Neurosurgery Doctoral Thesis on Robotics in Functional Paediatric Neurosurgery at the University of Barcelona, 2017 – 2018. Attendance at an intraoperative MRI-guided surgical procedure at the Alder Hey Children’s Hospital in Liverpool (United Kingdom, 10 May 2018). Training at the Paediatric Spinal Cord Dysraphism Symposium. Kaiser Permanente Oakland Medical Center (Oakland, California, USA, 9 – 13 January 2017). Visit to the Neurosurgery Department of the Evangelisches Klinikum Bethel, assisting in the placement of deep brain electrodes to record SEEG with Renishaw’s Neuromate robot (Bielefeld, Germany, 9 – 11 April 2011). Stay in the Neurosurgery Department of the Centre Hospitalier Universitaire de Grenoble (CHU Grenoble Alpes), participating in deep brain stimulation surgeries, SEEG, epilepsy surgery and neurosurgery (Grenoble, France, 2015). Visit to the Orthopaedic Surgery Department of Ospedale dei Bambini “Vittore Buzzi” (Dr Francesco Motta), assisting in the implant of two baclofen intrathecal infusion pumps and visiting the gait analysis laboratory (Milan, Italy, 9 June 2010). Three-year cycle in the European Society for Pediatric Neurosurgery (ESPN, 2010 – 2012). S. Candela, M. Vanegas, A. Darling, D. Ortigoza-Escobar, Alamar, J. Muchart, et al. Frameless Robot-Assisted Pallidal Deep Brain Stimulation in Pediatric Patients for Movement Disorders: Precision and Short-Term Clinical Results. J Neurosurg Pediatr. In press. S. Candela, P. Puerta, M. Alamar, U. Barcik, A. Guillén, J. Muchart, G. García Fructuoso, E. Ferrer Rodríguez. Epidemiología y clasificación de los quistes aracnoideos en niños (Epidemiology and classification of arachnoid cysts in children). Neurocirugía 2015; 26 (5): 234-240. S. Candela, B. Pérez, J. Rumià. Estimulación cerebral profunda como tratamiento de los trastornos del movimiento en la edad pediátrica (Deep brain stimulation as a treatment for movement disorders in the paediatric age). En Orduna Martínez J, López Pisón J (eds.). Neurocirugía Pediátrica. Fundamentos de Patología Neuroquirúrgica para Pediatras (Cornerstones of Neurosurgical Pathology for Paediatricians). Madrid: Ergon; 2017. ISBN: 978-84-16. Silvia Maya Enero, Júlia Candel Pau, Mónica Rebollo Polo, Santiago Candela Cantó, Rafael de la Torre, María Ángles López Vílchez. Central nervous system malformation associated with methamphetamine abuse during pregnancy. Clinical Toxicology; Published online: 17 Jan 2018. Jordi Pérez Bovet MD, Rousinelle da Silva Freitas MD, Patricia Puerta Roldán MD, Antonio Guillén-Quesada MD, Santiago Candela Cantó MD, Gemma García Fructuoso MD. Brain abscess as a cause of macrocephaly in a newborn. Pediatric Neurology 2014; 50 (1): 121-2. P. Puerta, C. Candela, C. Rovira, G. Garcia Fructuoso. Juvenile xanthogranuloma of skull base. Case report and review of the literature. Acta Neurochirurgica 2013; 155 (6): 1039-1040. Lecturer on the Master’s Degree in Neuropaediatrics at the University of Barcelona, since 2016. Teacher in the Nervous System Diseases class. Student placements in SJD Barcelona Children’s Hospital. University of Barcelona, since 2014. Speaker on the Advances in Neuropaediatrics Course, since 2012.